Editor’s note: We updated this story Monday and Tuesday for expanded clarification from Honda and Assured. Recent moves by Ford and Honda to stress certain auto body shops carries both risk and reward for the collision repair industry. On Friday, Honda announced the official launch of ProFirst, which was open to any auto body shop designated as an I-CAR Gold shop or achieving the VQ or Medallion benchmarks of VeriFacts. 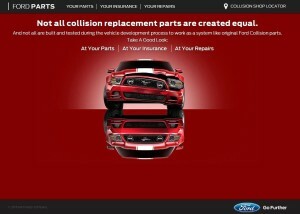 Ford, meanwhile, is ramping up its promotion of original equipment manufacturers parts and Ford-recommended collision repair shops with the “Take a Good Look” campaign and website. And in this vein, OEM-partnering Assured Performance is now touting its list of recommended shops to insurers. Automaker recommendations of which shops meet their standards could evoke “steering” concerns like some collision professionals have raised about repair program lists, whether it’s an emphasis on dealerships over independents or on underpriced repair bills that make ownership costs of OEM vehicles seem cheaper. It also could strain small shops who despite being just as competent as list members as might not be able to afford the time and money of jumping through certification hoops for numerous OEMs. On the other hand, a list of shops from an automaker might provide an alternative to controversial insurer recommendations from a voice whose interests are even more aligned with collision repair’s. A manufacturer likely has a greater stake in the car’s brand and performance — not to mention OEM parts revenues — than an insurer does. Such marketing could also ensure that shops are rewarded for the time and expense they sunk into preparing for more complex OEM vehicles through a highly prominent advertisement of quality. To make the ProFirst cut, the shop must also take Honda-designed courses through I-CAR and have certain equipment and a Customer Service Index system. There’s also a $2,700 annual fee and inspections by Axalta Coating Systems. For the money and time, you’ll make the Honda-Acura body shop locator and get all Honda and Acura service data and parts catalogs, free access to the Honda technical help line, and promotional items. Honda is keeping it elite in certain metro areas, limiting the number of shops which can receive the designation. “We want to make sure that there are enough shops in that area to service those cars, but not so many shops that it dilutes the ProFirst brand,” Honda spokesman Gary Ledoux, who was in New Jersey for the Northeast trade show, wrote in an email Sunday. Honda will not require Honda or Acura buyers to use ProFirst shops, though they’ll of course suggest those collision repairers, according to Ledoux. The Honda Collision body shop locator tied to ProFirst emphasizes OEM parts, but ProFirst shops won’t be required to use them, though “We always advocate for the use of Honda / Acura Genuine parts,” according to Ledoux. That will allow ProFirst shops to work for Honda or Acura owners whose insurance requires aftermarket or recycled parts, as well as satisfy DRP partner mandates or even a customer’s own wishes. Unlike recent partnerships with other manufacturers — notably, Ford on aluminum F-150 training offerings — to develop course material together, the two ProFirst classes were prepared exclusively by Honda. That was a first for I-CAR, which has its own Honda-Acura class. Read more about the classes here. The “Take a Good Look” campaign, launched this year and discussed in this “On Target” newsletter to wholesalers and collision repairers, is meant to stress the value of original equipment manufacturer parts to customers — over perhaps what an insurer wants. Apparently, they’re excluding Ford-reconditioned parts, such as remanufactured powertrain components. Ford also on that page doesn’t tie their statements to the fact that some of these parts are insurer-mandated, implying that a shop is trying to pull a fast one. Messages left for the Ford spokeswoman in charge of dealerships (and the contact for service and repair questions like this, according to another Ford staffer) were unreturned Friday. An emphasis on what shop an OEM thinks you should use was also displayed recently by Assured Performance’s launch Feb. 23 of the insurer-facing Advance Repair Capability shop locator. Shops on this database, which joins Assured’s Auto Body Locator for consumers, are certified by Assured and recognized by Assured’s OEM partners: a handful of the major makes. Getting Assured certification grants you OEM certification for all the partners at once. As the Assured requirements don’t include OEM parts, the certification won’t address shop-insurer sticking points like parts and labor — merely qualifications for repairs. However, that also means it won’t exclude anyone whose parts decision is taken out of their hands by an insurer or customer’s wishes.